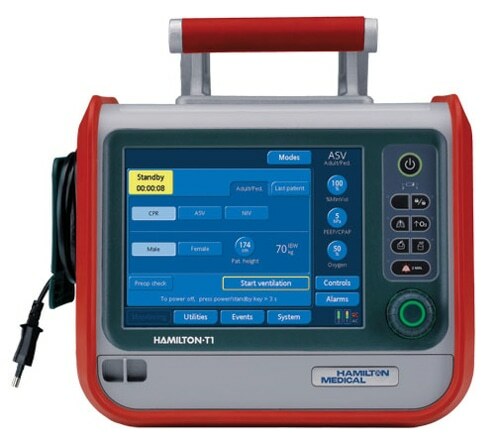 The Hamilton-T1 is designed to ventilate the adult or pediatric ICU patient at any place around the world. With its compact size of less than 6.5 kg, built in batteries with up to 5.5 hours operating time, 8.4" color touch screen and its high performance turbine, this ICU ventilator can accompany your patient within the hospital and between hospitals, whether on the ground or in the air. It's integrated high performing NIV capabilities add state-of-the-art therapy options for any transport situation.